Clayton Keller, Mario Kempe and Lawson Crouse, into an empty net, had the other goals for Arizona (22-22-4). Darcy Kuemper stopped 25 shots. John Tavares and Travis Dermott replied for Toronto (29-17-2), which got 27 saves from Frederik Andersen. The Leafs have now lost seven of their last 10 overall and sit just 13-11-1 at home — including 1-6-0 over their last seven — following a fourth straight regulation loss at Scotiabank Arena. After the Leafs tied the game early in the third period, the Coyotes came right back when Hinostroza tucked his fifth of the season shortside at 6:44 off a scramble with Andersen down and out. Toronto defenceman Morgan Rielly hit the post at the other end soon after on a shot that stayed out. Playing their third game in four nights following Friday's 3-1 road loss against the Florida Panthers, the Leafs pushed for an equalizer, but Crouse iced it into an empty net with his eighth with under 40 seconds to play. With his team in need of a spark down one through two periods, Tavares scored his 30th at 3:12 when he fired a quick shot off a Zach Hyman faceoff win that was helped along by Mitch Marner to awaken a slumbering Scotiabank Arena for a short-lived tie game. Down 1-0 after the opening 20 minutes, the Coyotes tied it at 2:16 of the second when Kempe moved in alone on Andersen and deked to the forehand before depositing his third stickside. Toronto head coach Mike Babcock challenged for offside, but the play stood after video review. The Leafs killed off the ensuing penalty for delay of game. 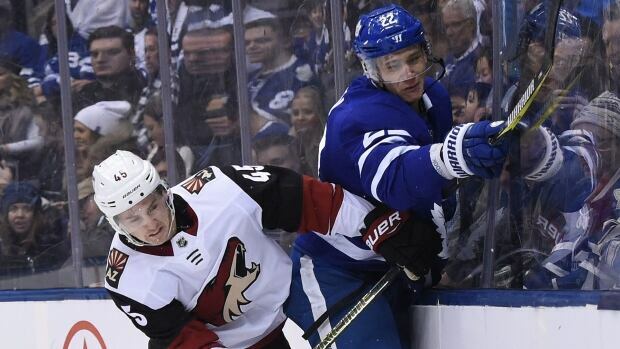 The Leafs then lost winger Andreas Johnsson to a concussion after he took a hit along the boards from Arizona defenceman Niklas Hjalmarsson and tumbled to the ice. Toronto's power play — just 6 for 51 over its last 20 games — went to work late in the second, but the NHL's No. 1 penalty-killing unit held firm.